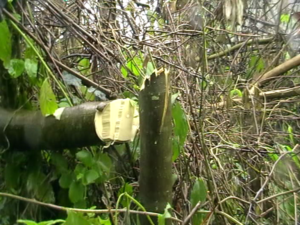 Tree cutting around Mt Elgon has been cited among the major causes of landslides in the area. Photo by Arthur Wadero. A landslide triggered by a heavy downpour has destroyed three villages in Bulucheke sub-county Bududa District in the Mount Elgon region. The incident that occured at 5:00pm yesterday destroyed houses buried livestock and left at least 200 people displaced according to Imran Muluga, the Bududa District Resident District commissioner. Muluga said a total of 40 families were affected in the villages of Marobo and Shikhuyu in Buluchecke Sub-county as well as Nabutsasi in Bumayoka sub-county. He said the displaced persons have so far sought refuge from relatives and friends at the nearby Bunamubi, Bulucheke and Kushu trading centres. Although there are no reports of deaths or injuries, rescue workers and volunteers have rushed to the affected area to assess the extent of damage. The State minister for Environment, Mary Gorretti Kitutu, who hails from the nearly Manafwa district told PML Daily that the mudslide has been inevitable. She blamed the mudslides on human activities, especially the cutting down of the forest cover for farming. “The environment has been compromised in a way that trees that would hold the soils together were cleared for cultivation,” Kitutu said. John Nambeshe, the Manjiya county Member of Parliament, blamed residents for not heeding to calls to relocate. “There are so many fresh cracks that have developed in the mountain. We are sitting on a time bomb and residents have stubbornly refused to relocate to safer areas,” Nambeshe said. Bududa has been prone to land and mudslides, with the worst happening on March 1, 2010 when more than 300 people were buried in Nametsi.